Rack your billiards correctly on the first try, every time with the 8 Ball Triangle Billiard Rack by Trademark Games. The smooth underside of this pool rack wont snag or pill the felt covering of your table as you set up for a proper break. The rack fits regulation size 2.25” billiard balls, making it great for pros who want to practice at home, and amateurs who want quality pool supplies. The low profile of this rack ensures a tight grouping without making it difficult to remove after setting up. The single-piece construction ensures that this rack will last for years to come. And the classic black color will bring style to any recreation center or game room. REGULATION SIZE- This rack complies with regulation measurements for competitive play, allowing professionals to practice at home and amateurs to have professional quality equipment. 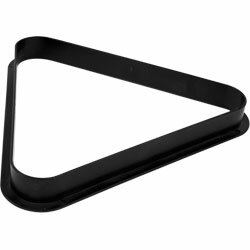 SINGLE PIECE CONSTRUCTION- The triangle is molded from a single piece of black plastic, ensuring that it won’t work apart over time. You’ll be able to set up for a proper break with confidence every time. TABLETOP PROTECTION- The smooth edge on the underside of the rack won’t snag or pill the tabletop felt, prolonging the life of your pool table and keeping your game room or community center looking great. STYLE FOR HOME OR COMPETITION- The classic black color of this billiards rack is sure to match the décor of almost any bar, rec room or community center and bring a long-lasting style to any competitive space. PRODUCT DETAILS- Materials: Plastic. Dimensions: 11.125” W x 12.375” L x 1.25” H.